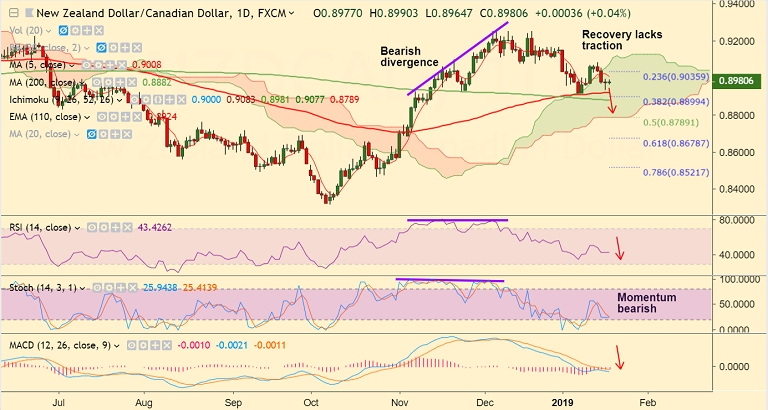 NZD/CAD edges higher from fresh weekly lows at 0.8935 with a Doji formation. Upside struggling to gather momentum, trades rangebound on the day at 0.8979 at 0730 GMT. Price action remains capped below 55-EMA and is on track to test 200-DMA at 0.8882. On the weekly charts the pair is edging lower from upper Bollinger Band. Is holding support at 0.8932 (21W EMA). Break below 0.8930 to see test of 200-DMA. Violation there to see further weakness. While on the flipside, immediate resistance is seen at 5-DMA at 0.90. Break above 20-DMA to see further upside.